We work in trying to understand molecular self-assembly processes as a methodology to construct large and functional multimolecular assemblies. A second area of our interest resides in the design and application of molecular containers. These are molecules or supramolecules that are sufficiently large to include or encapsulate other molecules. We investigate the effect that the confinement of molecules in reduced nanoscopic spaces may have in their chemical behaviour. We also use these molecular containers as new physical organic chemistry tools to quantify weak intermolecular interactions. The confinement of guests within molecular vessels modifies their chemical behaviour. While included guests can undergo reactions with significant rate enhancement and improved product selectivity. On the other hand, the inclusion of redox-active guests, generally, tends to slow down the kinetics of heterogeneous electron transfer reactions and shifts its half-wave redox potential. Several inclusion complexes containing electroactive metallocenes as guests have been reported. In non aqueous solvents, however, and to the best of our knowledge the inclusion of cobaltocenium cation 1a+ has only been achieved using supramolecular dimeric and hexameric capsules mainly through cation-? interactions. Nevertheless, hexameric and even dimeric capsules are harder to characterize or manipulate in solution than individual host molecules. Last year, we described that hybrid cavitand-resorcinarene 2a formed thermodynamically and kinetically stable 1:1 complex with tetraethylammonium cation 3+. The 3+@2a complex is stabilized by cation-? and CH-? interactions with an association constant value of 1.4 ± 0.4 × 105 M-1 in methanol. In fact, the calculated volume inside the van der Waals surface of cobaltocenium 1a+ (135 Å3) and its overall dimensions closely resemble those of the tetraethylammonium cation 3+ (156 Å3). In addition, both species are monocationic and prone to be engaged in cation-? and CH-? interactions. Consequently, we decided to evaluate the efficiency of the neutral hybrid cavitand-resorcinearene hosts 2 in the molecular inclusion of organometallic sandwich complexes. The complexation of 2a and 2b with cobaltocenium 1a+•PF6? was probed using 1H NMR and ITC titration techniques, as well as competitive UV-vis displacement assays. The binding constants of the 1:1 complex of 1a+•PF6?with receptor 2a in methanol was determined as 1.2 ± 0.7 × 105 M-1. While receptor 2b forms in acetone also a 1:1 complex with cobaltocenium 1a+•PF6? 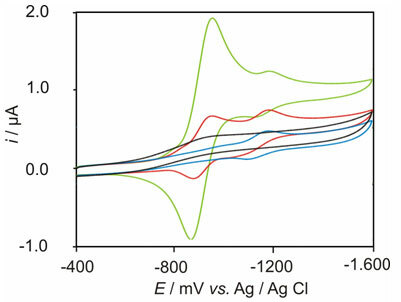 having a stability constant of 4.0 ± 0.4 × 103 M-1.The inclusion complexes formed with receptors 2 and the cationic cobalt(III) metallocene 1a+ and can be easily detected by mass spectrometry. When solutions of receptors 2 containing an excess of the cation are ionized with an electrospray ionization source intense signals corresponding to singly charged [1@2]+ and [4@2]+complexes can be observed. This result confirms the 1:1 stoichiometry assigned to these complexes. These experiments also allow the easy determination of which of the two metallocenes in the mixture is preferentially bound by the receptor 2. In both cases, intense signals for both 1:1 complexes are observed with apparent preference for 1a+@2 over 4+@2 a result in complete agreement with the binding experiments performed in solution. 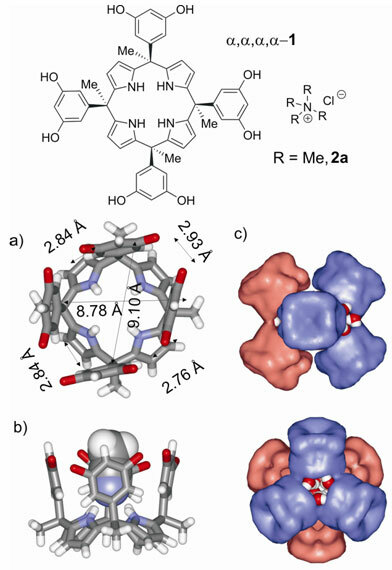 We also investigated the voltammetric behaviours of complexes 1a+@2a and 1a+@2b in MeOH and acetone, respectively, and compared them with that of free 1a+. As shown in Figure 3 the complexation of cobaltocenium 1a+ with 2a can be easily detected by the observation of two redox couples during a cyclic voltametry (CV) titration experiment. 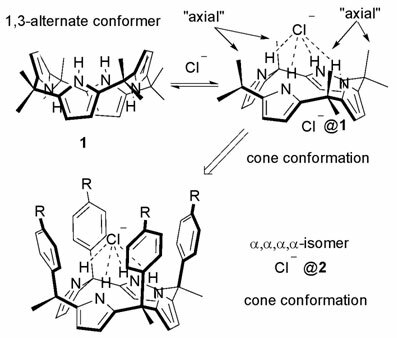 We have also reported the solid-state self-assembly of a calixpyrrole-resorcinarene hybrid 1 into a hexameric cage induced by complexation with tetramethyl ammonium chloride 2a. We have shown that the solid packing of the ?,?,?,? isomer of calixpyrrole resorcine hybrid 1 and tetramethyl ammonium chloride Cl?•2a is controlled by its relative stoichiometry in solution. On the one hand, an equimolecular mixture of calixpyrrole 1 and Cl?•2a yields crystals showing a columnar packing of the endo cavity complex Cl?•2a@1. On the other hand, the use of a high molar excess of the Cl?•2a salt induces, in the solid state, a self-assembly process of the endo cavity complex Cl?•2a@1 into a supramolecular hexameric structure. The self-assembly process is driven by hydrogen bonding and purely electrostatic interactions. The hexameric structure conforms an octahedral in which each vertex corresponds to the centroid of the pyrrole nitrogen atoms. Chemical intuition assigns a repulsive force to the interaction of anions with the ?-system of aromatic compounds. Consequently, for many years, anion-? interactions have been completely neglected as non-covalent interactions suitable for the construction of efficient anion receptors. A plethora of theoretical studies and the publication of several supramolecular complexes, obtained in the solid state, in which anions are nestled up next to aromatic rings has added additional interest to the subject. We have been using calixpyrrole structures as a model system to quantify anion-? interations in solution. The cone-like conformation of the ?,?,?,? stereoisomer of a calixpyrrole system bearing axially substituted aryl groups in each of the four meso-carbons contains a deep aromatic cavity capable of including anions. The formation of four hydrogen bonds between the halide ions and the NH groups of the calixpyrrole scaffold constitutes a reliable interaction which positions the anion above the plains of the ?-systems of the meso aryl substituents (“enforced proximity”). 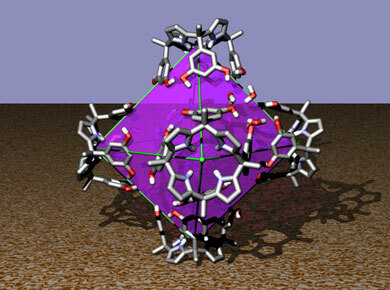 We have preliminary results indicating that in the solid state the binding geometry of the resulting halide-? interaction closely relates to the off-center interaction of anions with ?-system of aromatic compounds. We are collaborating in this research topic with Prof. Deyà and Drs. Frontera and Quiñonero form the University of the Balearic Islands that are investigating the physical nature of anion-? interactions using electronic structure methods.